About 11 minutes and 0 seconds reading time for this 3.1K word page. A few months back I asked people to complete the Living on Percentages income to expense spreadsheet that I had uploaded to the file section. Many of you did, it was great seeing the Percentages and not your actual expense to income dollar amounts. I don't need to know the cash I was just looking to see if you were within what we call a budget. Everyone has different income to expense needs, that's why it's not important when you are talking about debt to know how much a person makes. It's more important to know what they spend and the percentage between the expenses and income. This is the calculation loan companies take to determine if you can take on added monthly debt. But that's not what the SBA Disaster Loan Program did. Keep a focus on your living expenses as a percentage when you are reading this post. How does the SBA calculated your Maximum Loan Amount? But first, let's see how you can be "Declined" an SBA Disaster loan without having to die, go to prison or become unemployed for life with no possible employment in your future which basically says you are dead or in a prison that doesn't have a metal shop. Focus on the "repayment calculation". 1. Home: The Auto Decline process will make a determination on both credit and repayment ability. Those applicants whose credit score is less than the threshold established as satisfactory credit will be declined for unsatisfactory credit. After a credit determination has been made a repayment test will be performed utilizing the stated income from the application and the total debts from the CBR. If the repayment calculation results in Cash Available (CA) of less than $50 a decline will be generated for lack of repayment ability. " Editors Note: In previous SOP published by the SBA Disaster Loan Program it was stated that a minimum credit score of 530 is required. It appears in the new SOP no mention of credit score numbers are published. We need Grant Awards and Declined Letters from SBA DOB people that did not take or receive SBA Assistance. We have people Washington D.C. that work for the Office of Inspector General concerned about how the SBA processed your loan application and how they are reporting your loan amounts to the state. They only know the story, they to date have not heard from any disaster victims that declined to receive assistance due to the inability to repay the debt at your current household income to expense percentages. At the end of this post you will find the resource link to file your compliant, your story of what is really going on between disaster victims and the SBA Disaster Loan Program. Disclaimer: We can't force you to do anything to help yourself, we are not lawyers, we are disaster victims like you that have the SBA Disaster Loan program haunting us daily. We have seen nothing from local, state and federal politicians and after reading most all the "Big Fix" plans a rational thinking person would most likely think the plans are based on a single word that will not change in mean as "receiving assistance" which we feel is very important to define, "Assistance" the word that locks solid the SBA Disaster loan programs argument and means you receive money from the SBA which is in the FEMA disaster delivery sequence and a valid disaster resource for those that have the ability to "Repay" the debt that they accepted from the SBA Disaster Loan Program. With that said, do you understand how the SBA calculated your "Ability to Repay" as accepted by HUD, SBA and FEMA? Do you understand how the SBA Disaster Loan Program fits into the Disaster assistance delivery sequence? Background:The SBA Disaster Loan Program was created to reduce the debt burden placed on taxpayers for recovery assistance after a declared disaster. The SBA Disaster Loan program is a Federally Insurance Loan for Investors which in most all cases is secured by 100% collateral of the loan recipient. Private investment firms, brokers, conventional banks, credit unions, private companies are encouraged to invest billions into the SBA Disaster Loan Program to which every dollar that investors place into the program is secured by taxpayer dollars against default. The increased pressure to process loans and the method of processing disaster loans after a disaster has in part but the program at risk of increased defaults on loans that will place the debt burden on the taxpayers. Current numbers are averaging 4% in defaults on loans. This percentage was before our Louisiana Great 2016 Floods and the flooding in Texas in 2017. 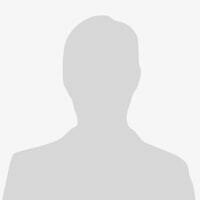 Would a prudent individual find the CBR (Credit Bureau Report) an accurate method of determining a persons ability to repay a debt? No, the process of checking reported debt as the only debt of a household is not accurate. Would a rational thinking thinking and prudent individual think that $51.00 per month in cash on hand after all CBR reported debt is paid is a good solid indicator of the ability to take on additional after debt? No, it is showing that CBR does not reflect actual living expenses and current debt not reported to the credit bureaus. Are you aware that your SBA Disaster Loan approval was based on your Tax Returns Net Income released by your signing of the 4506-T form and then comparing your income to ONLY your Reported Credit Debt found in Credit Reporting Bureaus such as Equifax, Experian, Transunion? Example: Your income per month, $1,000 your Credit Bureau reported debt, $10.00 (Credit Card Netflix Auto pay) your cash available per month $990.00 to repay an SBA Disaster Loan. The SBA Disaster Loan Program was reviewed by the SBA Office of Inspector General currently managed by Hannibal "Mike" Ware Inspector General who published SBA OIG Report 18-01 titled, "Report on the Most Serious Management and Performance Challenges Facing the Small Business Administration in Fixcal Year 2018"
Low Income Households can fall into an approved status for simply not having very low credit, demonstrating the ability to repay current debt or having a home that was paid off before the time of the disaster such as an inheritance. Low income households risk homelessness when offered a loan based on collateral and not the actual income to living expense need to calculate the true ability to repay debt. Simply having inherited a home does not make the household with average credit scores and good credit repayment history a valid candidate for an SBA Disaster Loan. The Report published by the SBA OIG identifies that many processes need to establish the ability to repay by the borrower were skipped or omitted by the SBA screening personnel after the disaster. This very important screening process of what a borrower can actually afford to repay has placed the SBA Disaster Loan at risk of default which will cost taxpayers and leave the borrowers effectively homeless. By not calculating the households current income to expense percentages the SBA effectively assumes that the household has no other debt than that reported to the credit bureaus. Omissions from the screening by the SBA include the required NFIP Flood Insurance for Flood Disaster Victims in Louisiana during their 2016 screening for SBA Disaster Loans. The SBA Disaster Program took NFIP Flood Insurance as a form of Collateral which clearly shows they identified the household as having this debt burden of NFIP payments but they did not calculate this living expense into the loan approval process. The SBA also omitted the household debt for the most basic of health insurance as directed by the Affordable Health Care Act. The SBA omitted all insurances from their loan approval process. The SBA Disaster Loan Program screening does not calculate basic needs such has utilities, food, household supplies, repairs and maintenance to collateral assets. The Small Business Administration Disaster Loan Program effectively will offer the maximum loan amount of $200,000 to households that clearly could not afford to pay $500 to $600 or more per month in additional debt. Disaster Victims across the board and no matter the type of disaster incur unforeseen debt after the disaster, everyone of them. This additional debt or loss of assets that are in need of replacing are not part of the screening process for homeowner disaster loans. The SBA Disaster Loan screening processed didn't take into account property taxes or income taxes. The SBA Disaster Loan screening did not take into account child support or spousal support payments. The SBA Disaster Loan screening did take into account federally secured student loans of homeowners and asked if they were planning on paying the loan back within a few short years so they can leave the loan debt off the screening process. The SBA Disaster Loan Screening was all about approval of loans from what was said to be the Maximum of $200,000 to the lowest unsecured by collateral loan of $25,000. What all 2016 Louisiana Disaster Victims didn't hear from the SBA was that their highest approved loan amount was going to be reported and be public record. This approval amount may have left the homeowner homeless or in bankruptcy before any additional federal assistance such as the HUD CBGD-DR Program was available. I'm sharing this information and encourage you to write to your SBA Office of Inspector General and share with them the details of your life's living expenses, your monthly income to expense percentages and your home that you worked hard to pay off or are paying on currently. 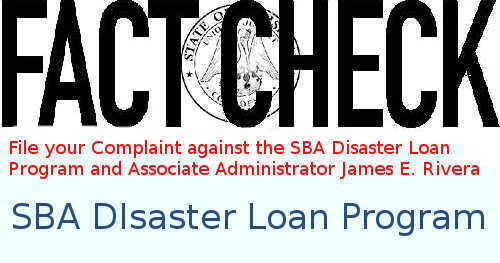 PLEASE, File a complaint against the SBA Disaster Loan Program using the SBA OIG Online Complaint Submission Form . Put into your complaint your total SBA DOB amount, your letter from the SBA stating that you cancelled the loan and be sure to share your actual household income to expense debt percentage you calculated with the Living on Percentages spreadsheet. Tell them about your screening process, about what FEMA told you to do, what you felt, how you think this SBA Loan program didn't take into account your ability to repay. Tell them the truth to what happened to you after the Louisiana 2016 Floods. The SBA is part of the FEMA Disaster Assistance plan and is actually second in the delivery sequence for disaster assistance. FEMA established the SBA Disaster Loan Program to offset the costs to taxpayers for the recovery funds need after a disaster is declared. FEMA made the agreement with the SBA to send all disaster victims to the SBA and let the SBA create it's own screening processes to identify households that had the resources to repay an SBA Disaster Loan and those that did not have the resources to repay the loan. The maximum loan amount was factored for every disaster victim and then offered to the victims household. There were no terms discussed at the time you applied, you might have felt you were simply being pre-approved, but rather you were applying for the maximum amount of loan the SBA Disaster Loan program was authorized to give you. We have shared with you information that took time to read and interpret. You are't going to find your states congressional representatives doing any more than putting words into a bill hoping the bill will be enter into law. None of our congressional representatives have ever questioned why a household making $18,900 per year was offered a $100,000 loan from the SBA Disaster Loan Program. Not one congressional representative has every questioned publicly the SOP loan processing policy and not one has asked publicly for the SBA to report to the state of Louisiana Office of Community Development that the loan was declined. As the Public Law 115-123 clearly shows, if a SBA loan was declined, assistance declined the Grantee will not count the SBA loan as a duplication of benefits. It is very clear to a rational thinking individual and when combined with our Public Law 115-123 and our HUD Guidance Sept. 16, 2011 which the State of Louisiana OCD-DRU follows none of the people that declined the SBA loan should have SBA Loans listed as a Duplication of Benefits. "Funds are not reasonably anticipated when the source and/or amount is indefinite, or the applicant is unaware that he/she may be eligible to receive additional funds at a later date. To address any potential duplication, beneficiaries must enter a signed agreement to repay any assistance later received for the same purpose as the CDBG disaster recovery funds. The grantee must identify a method to monitor compliance with the agreement for a reasonable period, and should articulate this method in its written administrative procedures. " Skip the "I Choose to remain anonymous" Do not check the box People and Names of People are important so you get the response you are looking for, now, if you are currently working in the SBA Disaster Loan Program that might be the only reason you would remain anonymous. Loan Number: Enter SBA loan number. Look on your Canelled Loan Letter, use the Loan number. This is all about you, do not spend time talking about the flood, do not say you have repairs to do, not now. Do not ask for empathy in any shape or form, please, focus on the real truth and tell the truth. You were offered a loan that you can not repay and/or do not want. You cancelled the loan, you have a letter that you cancelled the loan and you want the SBA Disaster Loan Program administrator to remove your loan amount from the data feed that is provided publicly and to all department agencies that are controlling the Duplication of Benefits. You want the data feed updated to show you CANCELLED the loan and if they can not show the word CANCELLED then you must request to be “WITHDRAWN” or “DECLINED” from the program. Ask what length of time will the SBA report your loan amount and status. Ask them to remove the loan amount on your cancelled loan. Ask them to send you in writing the maximum time you have to reinstate the loan. I want you to get in writing the time limits. I called SBA Monday and was told the loan can be requested reinstated anytime. I made reference to the SOP which states a maximum of 2 years, the customer service loan person told me it doesn't matter, as long as I send in a new Tax information release 4506-T and have not had any advise financial issues (death, imprisonment, citizenship revoked) the SBA Disaster Loan program will allow me to reapply for a loan and they will base it on my newest tax returns. Then you must ask for REMEDY, What do you want and don’t say I want an HUD CDBG-DR Grant in place of the SBA Loan. Ugh, read the delivery sequence if that’s your first thought. I can’t help, but if you are like Mr. Wallace, and living on 95% month to month of retirement and only need $26,000 to rebuild but can’t get it because the SBA approved you for $125,000 that you declined to take due to the payments being $439 per month for 30 years. If that payment amount placed you at or over 100% of your total monthly income you can not afford to repay the loan. When the SBA lowered the loan amount for Mr. Wallace they lowered the payment by $3.00 and shortened the term of the loan to 5 years. This is what the HUD CDBG-DR doesn’t see, they only see that Mr. Wallace was approved for $125,000 and that’s it. You can email me anytime, if you don’t know my email and can’t figure it out and I don’t see your PM then ask the admin of the group. Or just drive by the house, I’m here working on it, pulling nails out and cleaning the concrete this week. Have you reported this matter to any Organizations/Agencies? 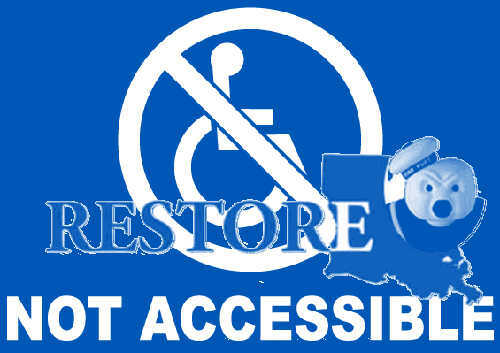 If you reported this issue to congressman Graves, senators Kennedy or Cassidy or any not for profit and anyone at Restore, OCD-DRU, the Governor, list them here. Now, here’s what is the most important part of it all. Your SBA Loan Cancelled Letter needs to be uploaded as your proof. No pictures of your house or yourself, just all the Cancelled Loan Letters you have. If you do this, you are on the path of fighting without waiting for our Congressional Representatives. It’s your battle, you applied to the SBA, no one forced you, you may feel you didn’t have the information needed to make a good judgment call but no one in the OCD-DRU office cares about that. They see what SBA shows them, your FEMA number, your Loan Status, your Maximum Approval Amount. Only the SBA can change what the state sees. You can also file an appeal while you are waiting for word back form the SBA OIG. I listed your argument in the body of this post. Your loan approval amount does not actually have an ending date to which the funds are no longer available to you. According to the Sept. 16, 2011 HUD Guidance "Funds are not reasonably anticipated when the source and/or amount is indefinite..."